Thanks to HVM Racing, a stand-out driver from the now suspended Atlantic Championship will bolster the female driver contingent to four at the 2010 IZOD IndyCar Series opening race on the Streets of Sao Paulo. Announced officially after the major Barber Motorsports Park test for the series, Swiss driver Simona De Silvestro joins the IZOD IndyCar tour for 2010. De Silvestro is one of only two women to claim victory in the Atlantic Championship by winning the 2008 Atlantic Championship race on the street of Long Beach. Looking to improves from the previous year results, Simona De Silvestro switched from Newman Wachs Racing to Team Stargate Worlds where she was teamed with actor-turned professional race car driver Frankie Muniz. In 2009, De Silvestro not only won four races on the tour (making the than 20 year old the winningest female in a single major open wheel racing series in the United States) but served as a serious title threat for the Atlantic Championship. Late season race day misfortunes at Mosport International Raceway and Mazda Raceway of Laguna Seca derailed De Silvestro's best efforts. Finishing third overall to the season's victor John Edwards, Simona De Silvestro efforts destined the young driver for brighter skies beyond the darkening clouds that eventually collapsed the Atlantic Championship. Besides Simona De Silvestro's presence on the race track, she has a part in the long-delayed but upcoming multi-player video game Stargate Worlds. 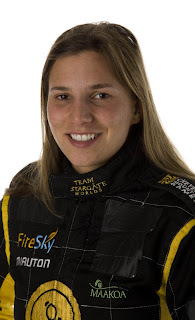 While race drivers have been appearing in the multitude titles of sports-related games, De Silvestro role with Stargate Worlds become a rarity being a professional racer in a non-racing game. Created through a partnership agreement with De Silvestro's 2009 Atlantic team Team Stargate Worlds, the Switzerland-born driver describes her opportunity ride with the #78 HVM Racing car as "a true honor".